Meretz Chairwoman says 'racist' haredi parties pushing secular population too far by refusing to allow stores to open on the Sabbath. 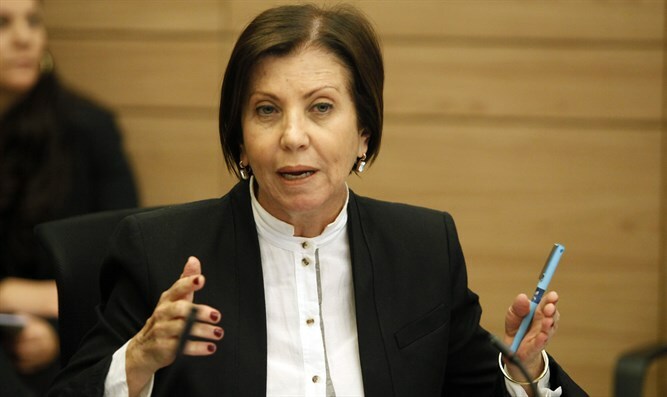 The government risks a civil uprising if it enforces the status quo on Shabbat observance in Tel Aviv, Meretz Chairwoman Zahava Galon wrote on her Facebook page Sunday morning. Galon's post comes against the backdrop of the Supreme Court hearing tomorrow in response to the petition the Tel Aviv municipality filed against the State over its refusal to approve the opening of 160 businesses on the Sabbath. The famed "status quo" agreement from the establishment of the state, whose goal was to give a Jewish atmosphere to the public sphere in the Jewish state, while not interfering with private activity, does not allow commerce on the Sabbath, but gives powers to local government on the subject. Secular Jews such as Bialik, who did not observe the Sabbath at all in their private lives, supported the idea, with writer Ahad Ha'am having coined the saying "More than the Jews guard the Sabbath, the Sabbath guards the Jewish people." Supreme Justice Shamgar saw the status quo on Shabbat commerce as a social welfare law as well, ensuring that workers are not forced to work on the day of rest. "Secularism in Israel is under attack," Galon wrote. "The attempt to close Tel Aviv on the Sabbath is just one front in the war declared by the government against the secular population, but it is an important front." Galon accused the haredi parties in the coalition of symbolizing "a radical and racist Judaism." "Netanyahu made a pact with radical Judaism, which is insular and racist. And the result is that secularists find themselves fighting once again for what should be basic: against the exclusion of women from the public sphere, against educators who call the LGBT community 'perverts,' against the imprisonment of a single soldier because he ate a non-kosher sandwich in his base, and against the boycotting of stores which sell Christmas trees and decorations." she wrote. According to Galon, the status quo is dead. "It is an empty shell. It is meaningless. Netanyahu and the haredi MKs wave [the status quo] in order to justify the continued erosion of the rights of secular Israelis. The status quo has become a weapon against the secularists, a platform with which to drive us deeper [into the haredi lifestyle], in the bedroom, [the food on our] plates, down the wedding aisle, and now on the Sabbath." "If supermarkets, cafes, and soccer stadiums will be closed on he Sabbath in Tel Aviv, the heart of Israeli secularism, imagine what the consequences would be for the secular population in the rest of the country. In Jerusalem, Ashdod, Petah Tikva, and Tiberius. Imagine the next subject [the government] will fight [secularists] on. But Israel has a large secular population, and [the government] is forcing them to see how the public space only bends to one side and is forcing them t pretend that it is raining [every Saturday]. If you touch us on Shabbat, be prepared to face a civil uprising the likes of which you have never dreamed of." she warned.